If I didn’t know any better, I would believe Keith has a crush on one of the local E.R. nurses because that’s were we spent our day again. What he optimistically hoped was a gas pain this morning is in fact a 5mm kidney stone. It is not his first (his third actually), and apparently once you have experienced that kind of pain you recognize it pretty easily– it is something along the lines of worst type of pain ever-so until he passes this thing he will be drugged up pretty good and I will be forcing water down him. The E.R. doc was pretty cool, though, and made sure we have enough meds should this scenario repeat while we are at sea, or at least beyond range of immediate care. We didn’t even bother to go into the fact that we have already been through that exact scenario with his first stone. Back in 2002, we were anchored in Double Breasted Cay, just south of Walkers Cay, when early in the evening Keith doubled over in excruciating pain-and stayed that way. The rest of that night was the scariest night of my life-and probably his too. The pain and vomiting were relentless. And we had no idea why. My biggest fear was an appendicitis. Due to the weather there was no way we could get out of the anchorage at night and we couldn’t raise anybody by VHF. (Double Breasted is just an uninhabited spit of sand surrounded by rock and coral heads in the northern most outer islands of the Bahamas.) It wasn’t until the morning when we were able to get a power boater to take us to Grand Cay, the closest inhabited settlement, but there was no healthcare facility there. Fortunately, a U.S. doctor on another boat was found and he came by but he was startled by Keith’s vitals and condition and said he had to get to a hospital fast. There wasn’t anything he could do with out the access to a medical facility. By this point Keith was delirious and I was hysterical but we took another jarring, pounding, slamming, terrifying open power boat ride to Walkers Cay, the next inhabited island. By this time I was pretty sure he didn’t have an appendicitis because that boat ride would have certainly busted it open!! (I mentioned the weather was crap, right) But, thank you still to the kind local who understood the urgency of the situation. 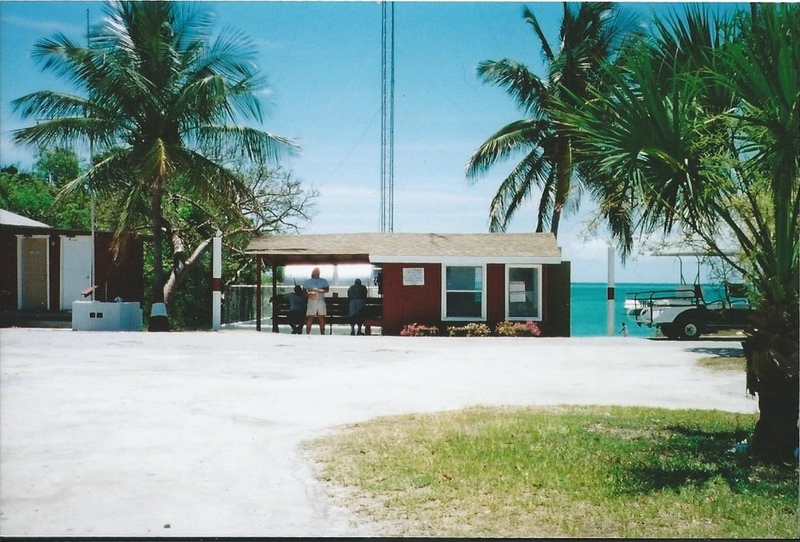 Walkers Cay has an international airport-it’s that red phone booth in the picture below- but an airport still. Unfortunately there are no flights in or out except for private little planes. At this point arrangements were being made with the US Coast Guard for a chopper but there was a delay in it being deployed. I can’t remember why now. But while we were waiting, a private charter plane landed to drop of some guys for a fishing trip. Miraculously, we were able to convince the pilot to take Keith back to Florida with him. I really think the pilot was afraid he was going to die in the plane. He did NOT want to take him- but he did. I’m not sure of all the details but somehow he managed to clear (skip) customs and get deposited by cab in front of a hospital. In my haste, I hadn’t remembered to put shoes on Keith when we got off the boat that morning. So there he was, delirious and barefoot wandering into the E.R. alone. His home, and wife, still in the Bahamas. He was treated for severe dehydration, a kidney stone and kidney infection. Good friends picked him up from the hospital and gave him a place to stay and nursed him until he was able to charter a plane and fly back into Walkers a week later where I picked him up. So, yeah, been there done that. Don’t want to do do it again. Let’s hope this stone passes on its own soon, if not we are going to have to take care of it quick-we only have a few more weeks before I will lose our health insurance. I guess it’s a good thing we are behind schedule. 2002. Keith returning from the states all fixed up and sporting a new pair of shoes. Where were we ONE year ago: Score! 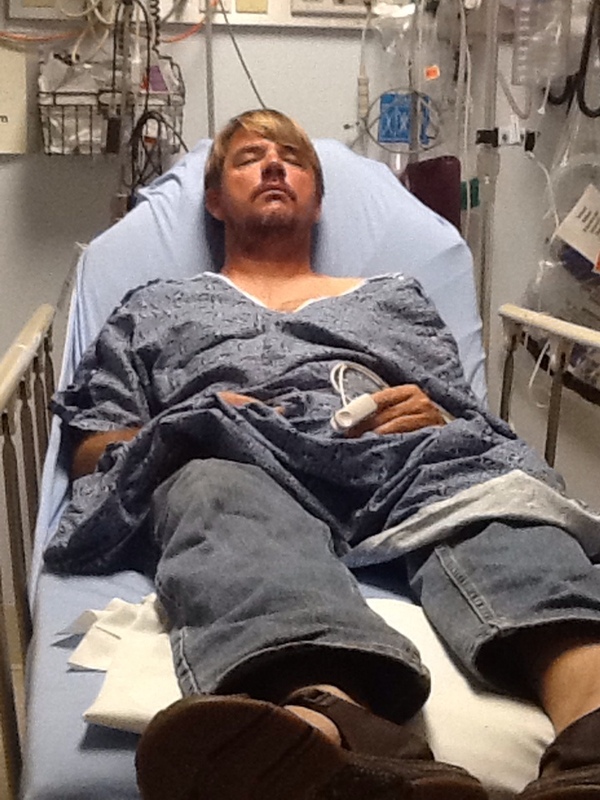 Thanks-Keith is doing well- he is very hydrated and has the pain and nausea completely under control this time. We were in the old neighborhood recently and checked out your new dinghy. Impressive!! That will be fun. So sorry to hear about Keith’s troubles! Hopefully this doesn’t happen again for you at Double Breasted. Walker’s is completely uninhabited now! 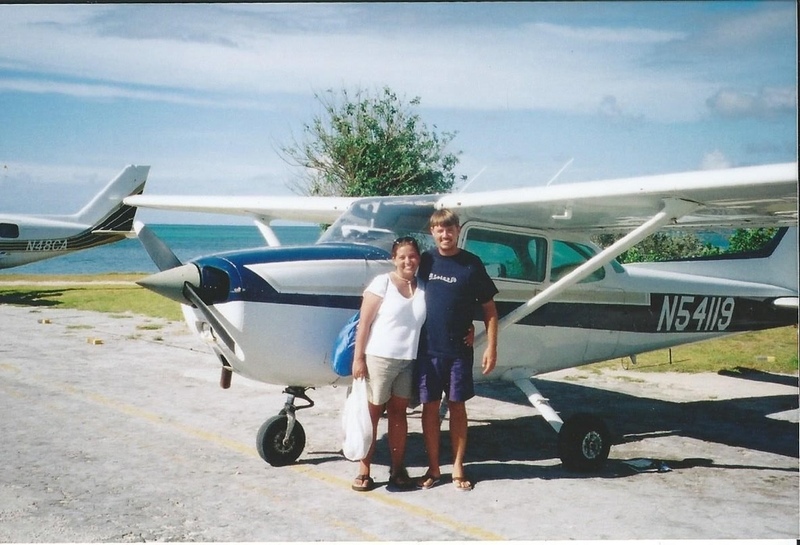 There is an airstrip, but no one on the island. The closest airport I think is on Green Turtle. Yikes!! Thanks Kelley, he is doing well, but still waiting for it to pass. For now we a a bit relieved to be running behind schedule!! We have just been loving your blog lately-it’s keeping us focused on what we are working for. It seems like you and Jason are having some good times. I hope the repairs aren’t getting in the way too much. Anything we can help with here- let us know!